Today we entered Lamar Valley, a vast canvas of sage brush, frozen river, a blanket of snow, and hundreds of bison. In the summer it’s a lush feast of grasses for pronghorn, elk, and bison. In winter, it’s a different story. The pronghorn have migrated to find food. 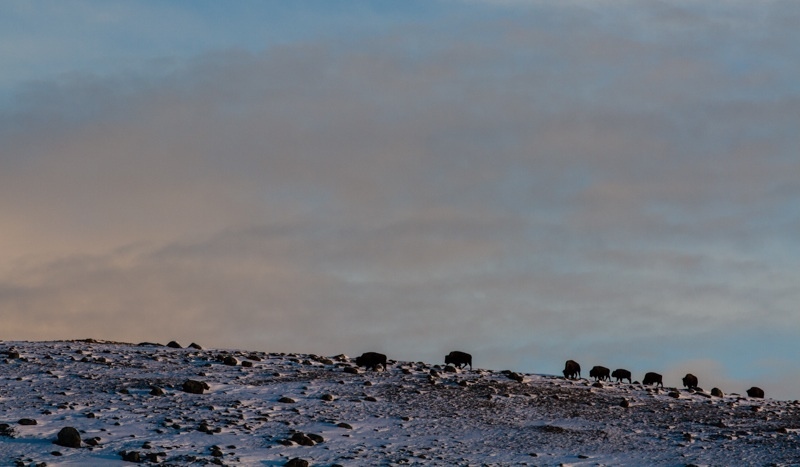 The bison sweep their heads in the snow to find the dormant grasses hidden below. They eat, but the grasses don’t have much nutritional value, so they are living off their fat and bone marrow. Winter is such a stressful time for the animals. The extreme cold and lack of food make them vulnerable to predators. We saw evidence of these predators today: coyote and wolf tracks along the road, a flock of magpies likely feeding on an old carcass, and two coyotes running along the river in the valley. The Lamar Valley provides a great winter home for these magnificent animals. We spent time with a photographer and naturalist who also calls this place home. 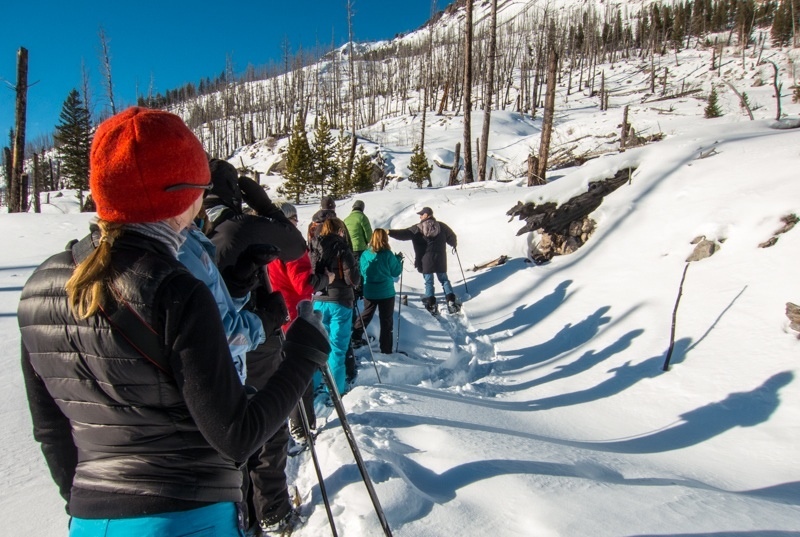 Dan Hartman led us on a snowshoe hike around Silver Gate where we saw the homes of little mammals called pikas. They gather grasses and flowers in the fall to build food storage for the winter called haystacks . Usually it is covered with snow, where they continue to live and stay active throughout the winter. Today we were able to see their homes because there hasn’t been as much snow to cover them. 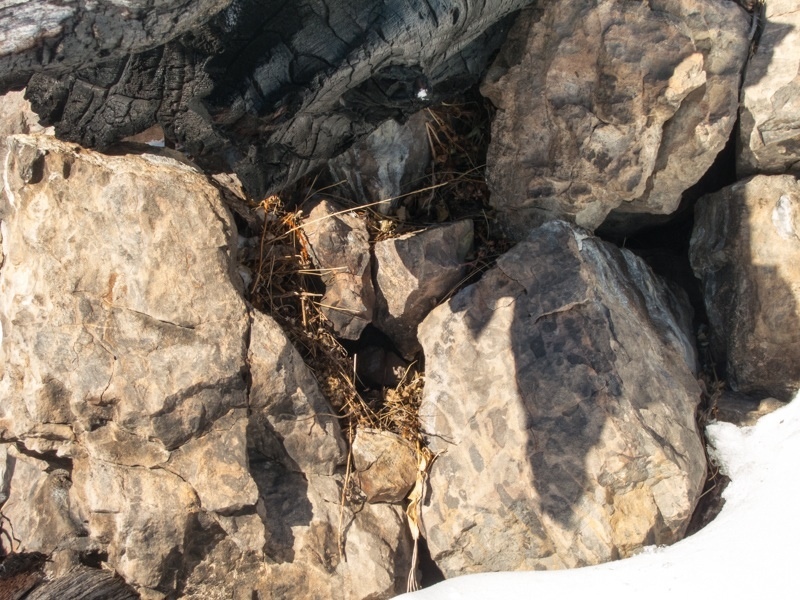 Just above the pika homes were pine marten tracks. Dan shared with us the stories behind many of his amazing photographs. When asked what makes Yellowstone such a special place, he paused and replied, “It feels like home. When we first saw Lamar Valley many years ago, we said it feels like home.” Even after a short time here, we are beginning to understand.